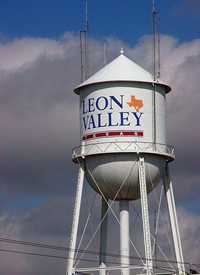 Leon Valley developed after WWII and incorporated as a town in the 1950s. It reported only 536 residents for the 1960 Census which has since grown to the present 9,239 (2000). The city, which at first glance appears to have more businesses than homes, deserves recognition for the care given to their (several) water towers.